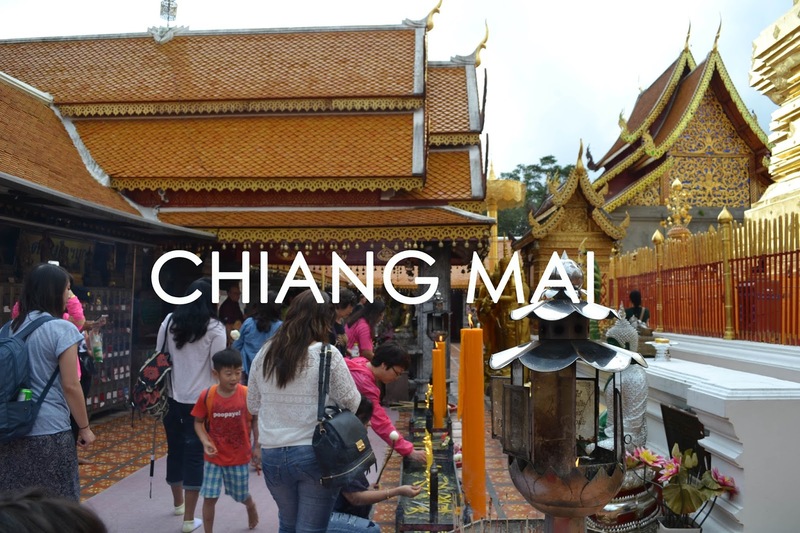 The Wander Dan | Beyond Itineraries: A calm but vibrant Chiang Mai! A calm but vibrant Chiang Mai! My fascination with Chiang Mai started because of the Thai romantic movies I have seen, I always thought it was the perfect setting for an interesting love story. I wasn't wrong. There's just so many reasons to fall in love with this town. The journey to Chiang Mai started from Luang Prabang, it was a long 21-hour bus ride of crossing the border from Laos to Thailand. This ride was one of those I could never forget because it was one of the moments that I genuinely felt like a traveler. Right upon reaching the terminal we met a lot of backpackers heading towards different destinations, all equipped with just a backpack and a passion to travel. The night was beaming towards the sky, we left the terminal of Luang Prabang around five in the afternoon. We didn't had much food other than a snack pack I would like to call a 'survival kit' that the bus company handed us. The bus crew were warm and accommodating despite their limited English. A few hours since we left, the bus started to be more crowded as local passengers started to board the shuttle, to me they appeared like Vietnamese and Burmese trying to reach Thailand for some work. I wasn't comfortable with the bus being cramped so immensely that even the floors get to be seated. But I was too tired and sleepy to mind so I got myself in a slumber. We reached our first stop over, I can tell this was a regular bus stop because right in the middle of nowhere is a street filled with merchants and eateries sprawling down to both ends of the road. It was so surreal to be in that moment, probably because I just woke up from a deep sleep so I wasn't at my full senses and because everything around me looked and sounded a bit strange. It was a delight to get a chance to feed our starting-to-growl stomachs. Unfortunately we had limited Lao Kips and US Dollar exchange rates were not very pleasing, this is aside from the fact that the food around didn't look safe to consume for a traveler spending the night on the road. So we settled in for some cup noodles and a fruit I couldn't identify worth 5 pcs/1 Dollar (which later on I learned was exxageratedly expensive in the Philippines). The bus ride continues and soon enough, morning swallowed the darkness and the view of the mountain ranges woke our senses. Before reaching the border, we went to our second and last bus stop to fuel up with some breakfast. We got ourselves a bowl of noodle soup which honestly was best of its kind we ever had. Later on we reached the border and stepped down the bus to get ourselves screened at the immigration and earn our Laos exit and Thailand entry stamps. It was all smooth and we were ready to hop on again after a quick thirty minutes towards our final descent to Thailand. Finally alighting at Chiang Mai was probably the most difficult thing we faced. Unlike Laos, Thailand does not accept US Dollars and unfortunately, there were no Foreign Exchange counters at the bus terminal even at a shopping arcade next to it. We tried to ask around and no one seems able to help us in such a crisis. We didn't had data on our phones and our ATM cards were not activated for international use. We went near the road and realized that the next mall was nothing less than a 30 minute walk. It shouldn't be very far, but we still had to carry all our luggages. Without a choice, we dragged our feet and after being grilled under the sun, finally reached the mall to purchase Thai Baht. Hailed ourselves a tuk tuk and went straight to "The Square" to check in at the hotel we booked. Our hotel was gracious enough to check us in with such a cozy room at Inn Oon Hotel. Read my story about it here soon. The Square is considered Chiang Mai's oldest settlement area where it is boxed in a canal surrounding the square. This is where the heart of Chiang Mai's culture and lifestyle lives. After pampering myself over a quick shower, we rushed out and went to explore the city. Food was amazing and the cost was everything we wished for. There are so many restaurants equally inviting that choosing became such a demanding task to do. Growing up, I was never a fan of street food but Chiang Mai is one of the places on Earth where it was inevitable to try. We got to try two famous restaurants along our hotel. Locals know best, and this is on top of their list. The first is the quaint Huen Phen which is known to serve authentic Chiang Mai dishes. According to the locals, there is a bit difference between traditional Thai and Chiang Mai food. I think Huen Phen was the perfect place to identify the difference. The second one is Mr. Kai Restaurant which is also famous for fruit shake and Khao Soi which should never be missed when in Thailand. We wandered around the Square and reached the night market just when the sun is about to set, shopping at this place was such a bliss. It's never Asia without the street markets and this to me looked like a shopping festival. I was hungry every minute so dining again at the night market sounded like a good idea to me. It was here that I have tried the best Pineapple Rice and the best Mango Sticky Rice in my entire existence - and everything came in very cheap. Flee and night markets are always the best places to find the most peculiar items and I never miss a chance to get close to them. These places offer a unique experience to interact with the locals, understand how their business system functions and appreciate the craft that is uniquely theirs to offer. The following day we joined a group tour towards Wat Phrathat Doi Sothep, a temple that sits on top of the mountain. This is a sacred temple to the Thai people so appropriate clothing is mandatory. We headed back to the center after finding ourselves some gem up the mountain villages. Its incredible a walk-conducive town so our itinerary-less afternoon led us to appreciate the numerous temples, boutiques and cafes. There's so many things going on in Chiang Mai. Countless arts and crafts boutique are piled at every alley. Numerous pubs and massage bars make the night so vibrant. Every street is peculiar and there's always something for everyone. The town is very active, but it's not intimidating the way a modern city is. This town is very subtle and gentle, vibrant but at the same time calm. Eating should be as pleasurable as cooking so we enrolled in a half-day cooking class to learn Thai Cuisine. By now I couldn't recall how those sumptuous dishes were prepared but with my cookbook, it shouldn't be very difficult to do. We enrolled ourselves in a half-day cooking school with Zabb e Lee and we got to learn how to cook Pad Thai, Curry, Tom Yum, Fresh Spring Rolls and a whole bunch of edible wonders that went straight into my stomach after cooking. Didn't realized that time flied so fast and the next thing we knew was that we were heading to the airport to catch our flight to our next destination, we had a remarkable experience that probably became a cherry on top of our already extraordinary stay in Chiang Mai. Our tukt uk driver Mr. Mek learned that we are Filipinos and he immediately recalled Filipino personalities that he has seen in television, we instantly had a good rapport to start with. He suddenly dialled in his phone and place his radio into its maximum volume. At first it was a bit strange to see his actions but we later realized that he actually called the DJ who was speaking on the radio and introduced us to everyone listening in Chiang Mai. We were caught off guard and Mr. Mek handed us his mobile phone so we can speak to the DJ live on air while simultaneously listening to our conversation on the radio - not to mention that we were onboard a tuk tuk enroute to the airport. That was such an experience not every traveler gets to experience. Truly, Chiang Mai is Thailand's warmest and friendliest city. It has an interesting vibe that tames the mood of a traveler be it for luxury or backpacking, it gives the charm only a countryside town can. Chiang Mai is a home for artists because there's quite an abundance of inspiration at every corner of this ironically laid back yet busy town. If I had much time in my bag, I would have stayed here for weeks. Thailand and Chiang Mai are like every places in this world. We have both good and bad things. Also good and bad people. Hope you see the first one wherever you go. Be our guest again anytime. You are always welcome.